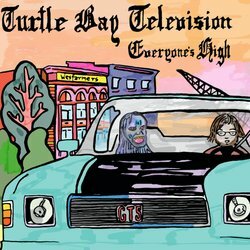 Turtle Bay Television have existed in various incarnations since 2012, currently operating as a 7 piece live band with most writing and recording being undertaken by lead songwriter, Thomas Cockram. What started out as a pretty straightforward Foals-inflected guitar music project has turned into an emotional outlet for discussing themes relating to mental illness and celebrating victories against it. As such, their shows aim to be cathartic experiences for both the band and the audience. The band's sound is very much influenced by the eclectic output of acts like Broken Social Scene, Mitski, The National, Spoon and Vampire Weekend, which has been a contributing factor to their large onstage presence and experimentation with standard song structures. The band have released two EPs over the past two years, as well as a number of singles, and intend to release an album in the coming year. This track reflects on singer, Thomas Cockram’s use of antidepressants and the resultant limitation on certain party related activities. It specifically refers to one particular gathering where he was the only one unaffected by such ‘activities’, so decided to engage in some ‘people-watching’ instead. Sonically, the song is inspired by the chaotic beauty of Wilco’s Yankee Hotel Foxtrot.